Vitamin D is one of the four fat-soluble vitamins. It is concerned with efficient calcium and phosphorus absorption. The vitamin works with various hormones to ensure that calcium and phosphorous are absorbed from the intestinal tract in the right proportions into the bloodstream. Calcium and phosphorous in the right ratio and amounts help determine normal bone growth. In addition, vitamin D stimulates the bones to accept calcium. Vitamin D isn't just one vitamin but, a group of vitamins. All vitamins in the group are come from a parent compound structurally similar to cholesterol. The compound comes in a variety of forms, two of which are especially important from a nutritional standpoint. Vitamin D2 (calciferol) is produced when ultraviolet radiation activates a sterol (fat-like substances in the steroid family) that is present mainly in yeasts and fungi (molds). Vitamin D2 is rarely seen in nature. It is manufactured in the laboratory and is regularly added to infant formulas and other fortified foods. 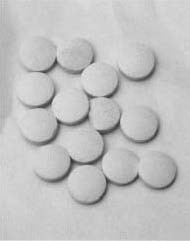 Vitamin D3 (cholecalciferol) is derived from a sterol present in animal tissues. In humans the sterol is converted into vitamin D on the skin's surface. The conversion is activated by ultraviolet rays from the sun. For this reason, healthy adults who are exposed to normal amounts of sunlight may produce enough vitamin D to avoid the need for added dietary sources. The need for vitamin D is greater in childhood. In infants and young children, lack of the vitamin can cause rickets (or rachitis). Rickets is a bone disorder that results in bowed legs, knock-knees, curved spines, and other abnormalities. Children with rickets have been discussed since Galen's time ( A.D. 130-200). A detailed description of rickets was provided as early as the seventeenth century. The cause of rickets, however, wasn't discovered until fairly recently. In 1914 England's Medical Research Council asked Edward Mellanby (1884-1955) to concentrate on finding a cure for rickets. Mellanby was a brilliant young English biochemist and a student of famous researcher Frederick Gowland Hopkins (1861-1947). Mellanby spent the next seven years at Cambridge University conducting feeding experiments on dogs. He was convinced that rickets had a dietary basis. Mellanby finally devised a diet that helped him prove he could cure rickets. He did so by adding certain fats to his animals' rations. In 1921 Mellanby wrote that the fats' effectiveness in rickets was due "to a vitamin or accessory food factor they contain." This "food factor" was probably identical to the fat-soluble vitamin that American scientist Elmer McCollum was working with. In 1922 McCollum and his associates discovered that their fat-soluble vitamin consisted of two separate vitamins. The first was vitamin A and the second vitamin they named vitamin D.
In that same year, McCollum and his group confirmed that cod liver oil was an effective treatment for rickets. Cod liver oil had been a folk remedy used to treat rickets for many years. A number of researchers went on to show that when the skin was exposed to sunlight or ultraviolet light, a substance virtually identical to vitamin D is produced. Independent researchers like Alfred Hess (1875-1933) and Harry Steenbock (1886-1967) continued to work on vitamin D. In 1924 Hess and Steenbock found that foods exposed to ultraviolet light developed sub-stantially greater anti-rickets potency. This discovery led to the practice of irradiating certain foods (exposing them to low-level radiation) like milk to help prevent rickets. Was Rickets disease possibly named after someone by the name of Rickets? I am a decendant of a Rickets and over the last 20 some years atleast 5 people in my family have been diagnosed with Osteomalacia or atleast very low levels of vitamin D. The only connection I have really been able to find between all of us in our ancestry. Some of us are allergic to milk or can rarely be in the sun, while others spend several hours a week in the sun and some drink up to 2 gallons of milk a week as well. Some of us have low calcium levels and others calcium levels are normal. I am just trying to figure out if it is something genetic that is causing us not to be able to absorb Vitamin D and if there is anything we can do to stop this trend in current and future generations. Any possible information you can provide would be greatly appreciated. Thank you. The Ricketts family. I have rickets too. Mine is called Hypophosphatemic Rickets. It is one of the more stubborn types and it has been passed down from my mom's side since as long as I can remember. I know it is more common for a girl to get it than a guy because of the chromosones. Like Jodi said, is there anyway to prevent it for my kids?